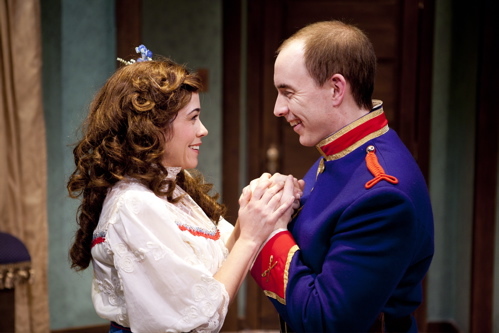 Amy Quiggins and Michael John Casey in Constellation Theatre Company's production of Arms and the Man. Photo credit: Scott Suchman. A play about the hypocrisy of war and romantic illusions set against the lunacy of class warfare seems like a perfect win for our Operation New Dawn, Occupy Wall Street days. No doubt G. Bernard Shaw, a playwright and critic of scathing intelligence, would’ve had something to say about these times of ours. As the International Shaw Society puts it, he was a "jesting juggler of ideas in a world of nothing but spin." Shaw (despite some wacky ideas about grammar) was devoted to the possibilities of changing society for the better, through the power of words. What would he have said about our own spin culture? Constellation Theatre Company’s production of Arms and the Man plays up the funny frolic aspect of the satire, with bright costumes and a clever set, while missing the bitter pill hidden in the "chocolate-cream soldier" dream of its lead character. That isn’t to say it isn’t delightful, it just needs more Shavian snap. But it does make for a charming night, in no small part due to the pairing of Amy Quiggins’ adorable Raina and Michael John Casey’s forthright Captain Bluntschli, characters whose unlikely love is guided with delicacy by director Allison Arkell Stockman. Brynn Tucker and Mark Krawczyk in Constellation Theatre Company's production of Arms and the Man. Photo credit: Scott Suchman. Shaw uses the backdrop of the 14-day 1885 Serbo-Bulgarian War to shatter romantic illusions about what makes one truly brave. First performed in the late 1890′s, it’s a snapshot of the kind of feckless patriotism that would soon lead to the Great War. Each character is held back in some way from their true potential, adhering to class prejudices and emoting like characters in an operetta. But underneath, they all yearn for something more. Into this artificial world bursts the plain-speaking Bluntschli, a Swiss mercenary forced to hide out in the romantic Raina’s bedroom. She thinks he’s a coward – after all, he carries chocolates instead of cartridges. He’s witnessed the cavalry charge of her bombastic fiance, Sergius Saranoff (Mark Krawczyk) – and knows a thing or two about real courage. The lesson will be both humorous and bittersweet. Shaw’s scripts are notable for long speeches convincing the audience of the futility of high ideals, and it takes a constant urgency to carry them off without losing the audience. Pacing in this production needs some tightening, as spurts of strong energy slowly start to drag. Hopefully that will improve during the run, as the heightened theatricality of Constellation’s style is well-suited here, especially with spot-on performances like Krawczyk’s sneeringly pompous Sergius. Contrasting that style with a more practical naturalism, as their roles should, are Casey and Daniel Flint. Flint gives a heartfelt turn as servant Nicola, whose sacrifice for love strips the pretense off the notion that only the upper class can be truly noble. Casey sketches the growing love of Bluntschli for the spirited Raina beautifully, and Quiggins makes her pretensions something more than just the illusions of a spoiled girl. After all, she lives in a precious, frivolous world, soon to be swept away by the calamity of a war that can’t be idealized. That danger is carried mostly by Brynn Tucker as the social-climbing maid Louka, as if all the underlying intensity of the coming storm is poured into one role. Even Shaw’s practical, self-made men wouldn’t be able to survive that wrath. I wonder how we’ll fare. Constellation Theatre Company’s production of Arms and the Man runs through November 20 at Source Theatre, located at 1835 14th Street NW, Washington, DC 20009. Closest Metro stop: U Street/Cardozo/African American Civil War Museum (Green line). For more information call 202-204-7741.